Our very own Paul Wright was featured on Above the Law and Lawsites for an article he wrote. Check out the full article below! Legal plans can help you grow your practice and make money. Much like health insurance, legal insurance offers benefits, rights and protections for everyday issues. I started my law practice in Dallas in 2002 and from the beginning I’ve worked with ARAG and other legal plans because I’ve always believed they provide easy and affordable access to justice for all Americans at a reasonable cost. Okay … to be completely honest, along with access to justice, I joined because I wanted more clients and I wanted to grow my practice. Establishing a volume of business. In fact, the volume allowed my firm to develop a system to identify coverage, provide the covered service, deliver the service product, get paid and close the matter. We’ve just recently adopted a billing profile for each client to help bring clarity to billing and alternative fee arrangements. Offering alternative fee arrangements for clients: These give the client the benefit of covered services while allowing us to provide additional non-covered services. Exposing the firm to numerous individuals we would have never met and opening the door to long-term client relationships. Although my firm accepts multiple plans, the support and services offered to attorneys by ARAG are excellent and include guides and marketing material, benefit coverage materials and even an online ARAG Education CenterTM. Plus they host networking and educational events for local attorneys. With these tools, an individual attorney or firm can leverage the resources of a national organization. Another benefit of working with ARAG? Billing submission is easy thanks to ARAG’s online case management and payment systems. In light of the volume, like a medical practice we have devoted one firm member to billing and issues related to legal plans. We have also established policies and procedures around each legal plan and cover plans during our firm retreats. Repeat business, both using and not using the plan. Personally and professionally, working with ARAG has benefited me greatly. I love working with ARAG clients. Being part of the ARAG attorney network creates new opportunities for me to meet great clients, network with ARAG employees and ultimately aids a guy who grew his law practice from the kitchen table of his house to a firm with more than thirty employees, three physical offices, and a variety of legal services. I even serve on the ARAG Advisory Board now. Legal plans and technology allow access to justice in ways that previous generations could never imagine. Today ARAG is at the forefront of the movement to affordable access to justice and legal services. It can grow your business, provide professional growth and, along the way, you’ll meet a lot of wonderful people. 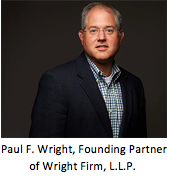 Paul F. Wright is the founding partner of The Wright Firm, L.L.P., where he practices in the areas of estate planning, probate and tax. Mr. Wright is a licensed Texas Attorney and a Certified Public Accountant. He is a frequent lecturer on tax, estate planning and probate, business succession as well as how technology impacts the practice of law.